So that was a bloodbath, to put it mildly. Kind of like an Overwatch tournament finals brought to you by Quentin Tarantino. Perhaps South Korea was favored going into this match-up, especially after their triumphant march up through the rest of the bracket. But no one expected Russia to lose so easily, much less roll over and die. That team wipe at the end was brutal, but not at all out of the ordinary given the three matches that came before it in the best-of-seven series. South Korea looked good, and they were good, but Russia certainly had a hand in making it look so easy. 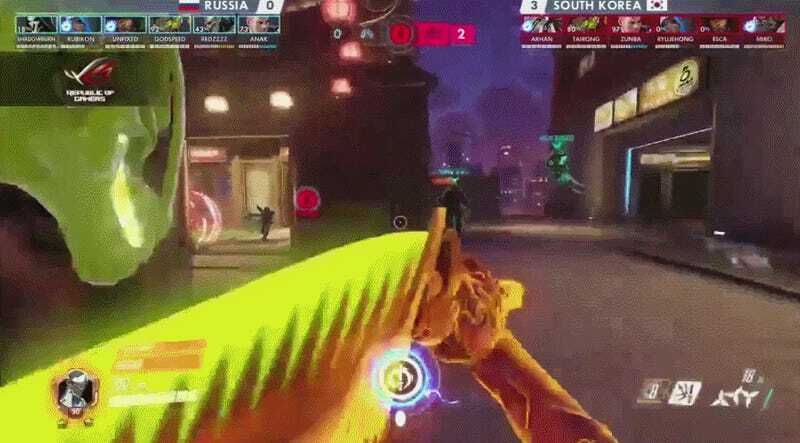 All it took was a poorly timed flash bang from Russia for Won Hyoup “ArHaN” Jeong’s Genji to rip them to shreds. Sombra handing out metals to the team after being trapped inside an ARG for several months. And with that, South Korea went 4-0 against Russia in the finals to claim another competitive gaming championship. In the end it was kind of like the most recent women’s soccer World Cup in which the U.S. went on to embarrass Japan 5-2, scoring four of those goals within the first sixteen minutes of play. South Korea wasn’t necessarily that dominant, and the scoreline does hide some moments where Russia tried to regain a foothold against the onslaught. But it wasn’t anywhere near as exciting as the third place nail biter between Finland and Sweden that took place earlier in the day. You can re-watch all four games from the finals below.